Do you ever make something so pretty that you're surprised? Maybe it's just something about Spring and the sloughing off of the old to make way for the new letting us see things with fresh eyes, or maybe it's the slow evolution that cooking just is. But sometimes a recipe that has been hanging around for years, suddenly seems to morph into something truly special. 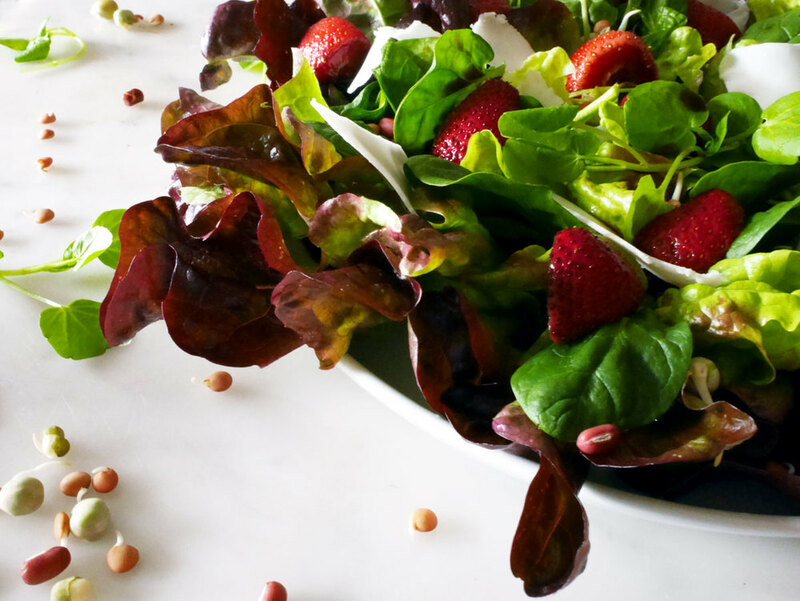 A few years ago I created a fairly basic salad using strawberries, spinach and vincotto*, it was delicious, quick and easy, but nothing particularly special to look at. Over time I've made the recipe more times than I can count, adding an ingredient here and a tweak there to improve on flavour and texture. The original recipe now enhanced by a soft chevrette offsetting punchy balsamic which itself pervades the strawberries, instead of dominating them, since changing the preparation method and the wild rambling prettiness of watercress adding a pop to the looks and some pepper to the flavour. Regardless of what it used to be or which change perfected the flavour balance this salad is perfect for these early spring days, leaving you full and satisfied but not stodgy like the winter foods that it's time to move away from. In a small saucepan, over medium to high heat, place balsamic vinegar and dark brown sugar. Bring to a boil and then reduce heat to a simmer, stirring contents until sugar has dissolved. Remove from heat and allow to cool. Hull and rinse strawberries then cut into quarters, place in a glass lidded jar. Next pour balsamic vinegar / brown sugar mix over, seal and place in refrigerator to marinate for a minimum of hour (this can be done up to four hours before serving the salad). Rinse oak leaf lettuce, spinach and sprouts and mix together, placing in a large bowl or on a platter. Drain strawberries, retaining liquid for use as dressing. Add strawberries to leaf mix and sprinkle Chevrette over. Pour dressing over as desired and serve. Sitting in the dappled Spring shade on your picnic blanket, soaking in the warm suns rays and forgetting about the Winter frosts.